Our most spacious garden bench, the April bench, measures 128cm from outside arm to arm. Its attractive curves on the backrest and frame, and lattice design on the seat have made it a popular choice with our customers. The bench has over 150 glowing reviews from our customers. It is available in Antique Bronze, white, sandstone and Slate Grey. The April bench, as with our smaller benches, is made from cast aluminium. This allows you to leave it outside all year round without worrying about weather damaging it. 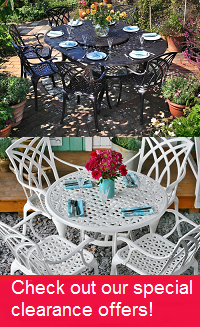 Despite being common materials for garden furniture, wood and iron come with drawbacks. Wooden garden furniture is susceptible to rot and splitting if it is not maintained diligently. This means sanding and coating with weatherproof paint. In turn, this means extra effort and money from you. The same is true of cast and wrought iron whereby weatherproof paint or furniture covers are required to prevent them from rusting. These are worries that you won't have with cast aluminium. No rot or splitting and no rust. Relax in winter knowing your patio bench will be fine during the rough weather, and spend more time in Spring and Summer enjoying your garden. We offer free delivery of the April bench. There’s no need to worry about extra shipping charges. Parcelforce is our courier for deliveries of garden benches, generally. They offer you the ability to track your delivery in real time on a map on their website. On the morning of delivery, they can send you a text message to let you know in which one hour time slot they will arrive. For more details about delivery you can have a look at our delivery information page or give us a call.